Over the last decade, Saskatchewan has experienced $144 billion in new investment. The province has a business-friendly environment that attracts international resource giants and helps local companies grow. The Government of Saskatchewan has worked hard to make Saskatchewan’s economic climate competitive with low corporate taxes, targeted incentives and clear, consistent regulations. An added competitive advantage is the government’s network of investment experts who act as a single point of access to get investors the information and services they need to set up operations in the province or grow existing ones. Whether it is in agri-value, mining, energy, forestry, manufacturing or technology, Saskatchewan Ministry of the Economy’s investment experts have helped numerous projects get off the ground. What sets Saskatchewan apart for investors is the sense of community in the province. Economy investment staff can quickly access the right contacts in both the private and public sectors to help investors advance their projects. Economy staff work in close partnership with Ministry of Agriculture on agri-value projects and pull in other ministries and provincial Crowns where required. They also collaborate with Global Affairs Canada to provide services to foreign investors. 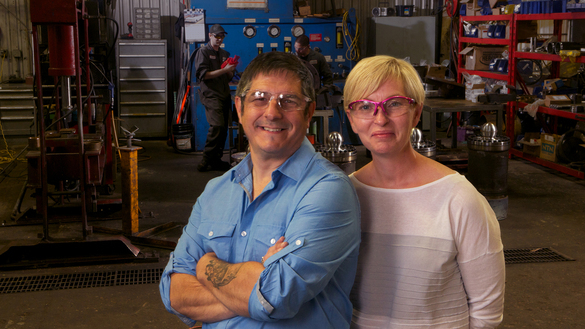 Rob and Katherine Tebb discovered this when they had some major decisions to make for their hydraulic cylinder manufacturing and repair company – Xtended Hydraulics. Started in Regina in 2013, the company had outgrown its space by 2016 and needed a new location. Economy investment staff helped them connect with officials in the rural municipality where they wanted to build and navigate the permitting and approvals required. Xtended Hydraulics turned sod at their new location in June 2017 and plan to move in by spring 2018. The new facility will be twice the size of their old location and employ 20 people. In the past few years, Economy has helped the Tebbs connect with procurement managers in mining and energy companies. The Ministry partnered with the Saskatchewan Mining Association to start the Mining Supply Chain Forum, held each April, which brings mining companies and suppliers together. The Tebbs have found the networking and education at the event invaluable. Economy’s efficient regulatory process helped K+S Potash Canada adhere to its project timelines in the construction phase leading up to the opening of the Bethune mine in 2017 – Saskatchewan’s first new solution potash mine in more than 40 years. Economy also helped connect the company with a network of local suppliers, mainly through the Mining Supply Chain Forum. K+S worked with as many as 3,000 contractors and employees on site during peak construction periods. To date, this project is Germany’s single largest investment in Canada.